We have a liquor license, so we are exclusive on bar services going through the venue. Our bar packages are priced per person and range from $14-24. We can also customize bar packages and services. Please inquire for more information about our bar options and what we offer. Can I bring in any caterer I choose? RMEP does have a preferred vendor list for caterers, but we do allow caterers not on the list to work in the venue. All caterers are subject to approval and will be required to provide copies of their health department certificate, business license and insurance. Full service catering staff is required. Self catering is not allowed. Why are you exclusive with your in-house DJ? RMEP has partnered with Elite Sounds Entertainment Group (ESEG) to provide exclusive DJ services at our events. ESEG has equipped the venue with a state of the art sound and lighting system. ESEG provides the level of quality entertainment we want at our events. We understand there may be some clients that want to bring in a DJ of their choice and opt out of services through ESEG. A lot of time and money has been invested in our in-house sound system, so we want that system to be used. Bringing in an outside DJ company or utilizing the in-house sound system without a DJ that ESEG has installed is subject to a $250 plug in fee. Live bands are permitted, but required to bring their own sound equipment. Parking at RMEP is easy and convenient. We provide 20 permits for our private parking lot for evening and weekend events. There is street parking up and down our block and a public parking lot one block away with 200 spaces. How many people can your space accommodate? Our maximum occupancy is 225. We can accommodate this number for a cocktail setting with limited seating, meaning there would be a mix of table/chair seating, cocktail tables and lounge furniture and not all guests would have a seat at all times. For sit-down dinners using just the indoor space we can seat up to 150 with a DJ, dance floor and head table. Seating these numbers inside would require tables on both our main floor and the mezzanine areas. Additional seating can be accommodated if the patio space is tented. Live bands and photo booths will impact floor plans for seating and what we can accommodate. Part of our planning process for your event is to sit down and customize a layout to meet your event needs. Please inquire for specifics on what layouts we can accommodate for corporate events with our A/V set up. Can I hold my ceremony at RMEP? A fee of $750 provides for your ceremony to be held at RMEP. 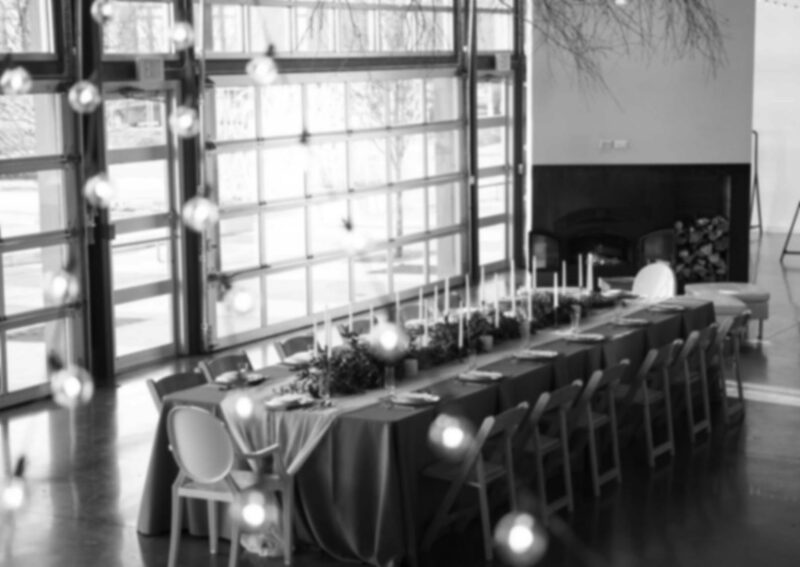 With the ceremony fee you get an additional hour of event time, a floor plan for both ceremony and reception, event staff to perform a room flip, extended time for bar service and use of the Airstream Lounge by the wedding party prior to the ceremony. Ceremonies are most ideal for guest counts of 150 or less. We do recommend tenting the patio space if you are hosting a ceremony onsite, so you are guaranteed that area to use during the room flip. How does the room flip work? After the ceremony an announcement will be made asking guests to gather on the mezzanine, patio and front terrace while the main floor is flipped for the reception. At this time the bar will open up to guests and they can gather in these areas for a cocktail hour. RMEP staff will then perform the room flip on the main floor, which typically takes about 30 minutes. We provide all of the furnishings for the space, which includes: (160) natural wood folding chairs, (15) 60” and (8) 48” round tables for guest seating, 9 wood top cocktail tables, 6 foot and 8 foot banquet tables to be used for buffets, head tables and other accent tables, white leather lounge furniture, a large custom built wood/glass top table ideal for gifts, favors, etc., custom built bars and a coat rack. Please inquire for our most up to date information sheet that lists all furnishings. What about linens, glassware, china and flatware? These items are not included in the rental fee. We do offer linen rental coordination as part of our service. During our planning process we can assist clients with linen options and pricing, then we will handle linen orders with our preferred vendors. Bar glassware is included with our bar packages. We prefer to leave the rental of china, flatware and glassware not associated with the bar to your caterer, but we can coordinate the rental of these items upon request. If I want to tent the patio space, is the tent included or does that cost extra? The tent rental does cost extra. We work exclusively with a local company for all tenting jobs at RMEP. They do a custom job and offer several different tent sizes for our space. Pricing for tents ranges from Please inquire for more information and pricing. Will someone from your staff be onsite the day of the event? Yes, we always have staff onsite from beginning to end. What does your staff do? Our staff is onsite to deal with any issues that may arise with the venue, like adjusting the thermostat and lighting, tending to the bathrooms, taking out trash, etc. We will see that all vendors know where to load in and set up. Our staff is on hand through out the event to answer any questions or address concerns. Do you provide a coordinator for my event? We do offer day of coordination services in-house. Please inquire for more details about these services and what is included. Who handles the set up and clean up? We will handle the room set up and tear down. The room will be set prior to your access time and if we have coordinated linens, tables will be dressed as well. At the end of the event we handle trash and breaking down all furniture. A cleaning crew comes through after the event and handles the sweeping, mopping, bathroom clean up, etc. Clients are responsible for any décor set up and for removing any décor and personal items at the end of the night. RMEP does offer some additional concierge services for an additional charge if you want us to take these tasks off your plate. Please inquire for more information on what services are offered. Do you require a security presence during the event? Yes, we contract KCPD off duty officers for all evening events and any event where alcohol is being served. Security is included in our evening and weekend pricing.